Deep in the rugged landscape of eastern Oregon, a young anthropologist named June Stefanov uncovers an exquisite artifact - a three-hundred-year-old mechanical doll - which is evidence of what she has spent years searching for. This is no ordinary doll...it is proof of a living race of ancient automatons that, she believes, exists to this day. Ingeniously hidden inside the intricate doll is a message, addressed to the court of Peter the Great, czar of Russia. In 1725 Russia, Peter and Elena, two human-like mechanical beings known as 'avtomat, ' are brought to life under the guise of Peter the Great. Their struggle to serve in the court of the czar while blending in, and to survive amid those who wish to annihilate them, will take Peter and Elena across Russia, Europe, and, ultimately, across the centuries to modern day. Daniel H. Wilson's masterful new novel seamlessly interweaves past and present, exploring a race of beings that lives undetected among us. As June learns more about the 'avtomat' doll she has discovered, she is quickly drawn into a fierce and poignant battle that has spanned the centuries - and will ultimately affect the survival of this ancient race. Before I start getting into my thoughts, I need to make 2 things clear. First, I am incredibly critical when it comes to the narrators of audio novels. I return over half the novels I get from Audible because I don't like the narrators enough to actually listen to them. Secondly, I listened to this book because of the narrators. I actually had no interest in this book at all, but I enjoyed both David Giuntoli and Claire Coffee in Grimm, which I watched--until it became utterly unwatchable. Even though I gave up on that show, I always said I'd follow the cast and this was apparently my first stop. ...and then I worried that I had made a horrible mistake. I really don't want to write what I'm about to write, but what is the purpose of a review if not to share how you felt about something? Claire Coffee is the first narrator and the first thing that I noticed is that her voice is much higher and reedier than I realized. I don't know if she modulates in her acting roles or if I just never noticed it when I was actually watching her, but her voice is not the type that I prefer to listen to. Still, I wanted very much to like this so I told myself that I could get over the timbre issues and continued. Then I noticed that she seemed to never have enough breath to finish her sentences. I think we've all had those times when we are just trying to squeeze out the last bit of breath in our lungs to get out that last thought, but she seemed to be doing this for nearly every sentence. That is indicative of breath control, and something I find horribly irritating (in part because it induces flash backs of my college voice instructor yelling, "SUPPORT!" and jabbing her fingers into my side). Honestly, I was shocked that Coffee was having this issue, as it is something that actors master early in their training. Things were not going well. Still, I continued to listen and I was, frankly, floored by her one-note performance. There was barely any animation to her voice and her character, June, came across as lifeless. In one of the early action scenes, Coffee did liven things up a bit, but in a way that really didn't make any sense. She was more animated in the description passages, but the actual dialogue was almost lifeless. I wasn't even sure how I was supposed to feel during this section. Then, there were the accents. Or what should have been accents. I'm not exactly what she was trying to do, but the result was not any accent that I recognized, which was that thing that just made every.single.thing.worse. for me. Honestly, if a narrator can't do an accent, they just should even try. In short, I felt that Coffee was just reading a book..and let's just keep that sentiment in mind for a moment. Coffee and Giuntoli alternate chapters, with Coffee reading the present day sections told from June's point of view and Giuntoli reading the sections set in the past told from Peter's point of view. Once I got about 30 seconds into his first chapter, I was all, "What strange magic is this?" Look, I've always known Giuntoli was a capable actor (probably more than capable, but Grimm really didn't give the actors much to work with), but I never would have pegged him as someone up to the task of giving the performance I found in this audiobook. It wasn't that he was animated (although he was), but that he drew me into the story. His pacing was spot on, he imbued his passages with great humanity (keep in mind, he was reading the part of what is essentially a robot. A robot with a soul, but still. ), he brought to life not only Peter, but any character he read, he hit all the accents nearly spot on, and I could not stop listening. I had a problem. I desperately wanted to finish this book because of Giuntoli's narration, but I couldn't bear to suffer through any more of Coffee's narration. There was only one way to remedy this--I ended up downloading the Kindle version of the book and synced the two. I would read June's chapters and listen to Peter's chapter and that worked surprisingly well. As an aside, though, I should point out that when you do this, you can listen to the book through either the Audible app or the Kindle app. I tried both and found the Kindle app to be buggy for listening. My recommendation would be to just stick to the Audible app. As long as you have WiFi, or have your apps set to use cellular data, the two will still sync. The experience of this book, for me, was mostly about the narration, but I do want to address the story itself. I was lukewarm on it, but I am chalking that up to preference instead of quality. Steampunk is an acquired taste and is not for everyone. I know the basics of Steampunk and have read one other book in the genre--a middle grade novel--but this one was just a bit too much for me. From other reviews, it looks like those who enjoy steampunk are loving this book. But, if you aren't too familiar with the genre, I wouldn't call this a gateway novel and you might want to start with another title. 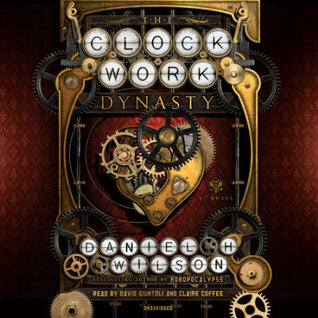 When it comes to recommending this book, if you like Steampunk, you'll probably love this. If you want a truly exceptional listening experience, get the audio book and listen to David Giuntoli's chapters. If you aren't really in to either of those, I'd skip this one. **Let's have some fun! As I said, I now have 2 names on the "I will listen to you in ANYTHING" list, one being David Giuntoli. But who is the other name on the list? I left you a few clues and now I'm giving you a chance to guess who it is! You can submit one guess a day through Tuesday, August 22. I will choose one person who correctly answered to win a $15 Amazon gift e-certificate. While this game is open to anyone, the e-certificate will come from Amazon's US site and will need to be redeemed through the same site. And, if you want to know who this is, I'll do a reveal in my August 27th "It's Monday, What Are you Reading?" post.